The Bank of Ceylon’s Landmark 1000th ATM/CDM Network in Kuliyapitiya. The Bank of Ceylon installed its 1000th ATM/CDM point in Kuliyapitiya 2nd branch on the 26th November 2018 in line with the opening of newly relocated Kuliyapitiya 2nd Branch. 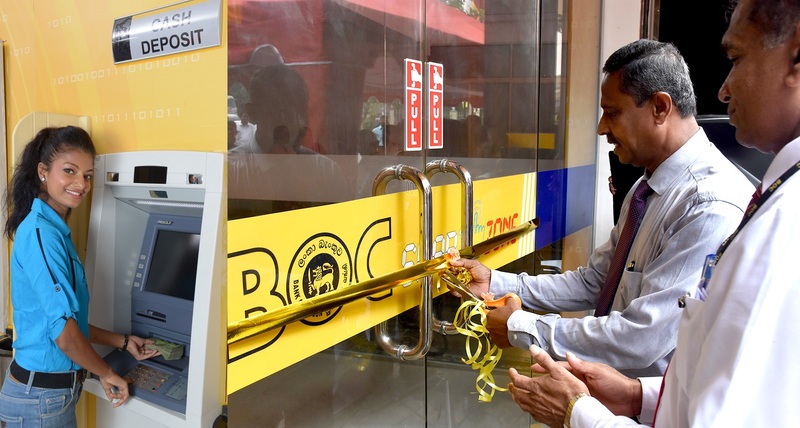 Expanding the reach to facilitate every Sri Lankan with the digital technology, the No.1 Bank in Sri Lanka, Bank of Ceylon becomes the only Bank to own a CDM/ATM Network with 1000 machines in Sri Lanka. The 1000th machine was declared opened by Deputy General Manager Sales and Channel Management Mr. C. Amarasinghe. As a part of the objective to empower Sri Lankans through digitalizing the banking landscape of the country, BOC began its digital transformation journey way back in 2015 and now operating at its best. Customers throughout the country can enjoy seamless banking transaction 24 x 7 conveniently and securely with these strategically located CDM/ATM machines. Another objective the Bank has fulfilled was to take the latest banking technology over the boundaries of Colombo and its suburbs to other areas of the country. “We are happy to announce that our mission to empower Sri Lankans throughout the country, to access convenience of Banking despite geographical barriers, have been a success story and we have enriched lives of the rural population through our digitization strategy. We have connected our customers to transact among each other wherever they are and whenever they want. ”stated the Head of IT Mr. Laxman Perera. “Our reach has become one of our greatest strengths, it strengthen our claim on the title-Banker’s to the Nation’. This initiative is another step forward to provide a reliable and convenient banking service to customers around the clock, we look forward to move forward with this process by identifying more strategic hot-spots in outer Colombo areas.” stated the Deputy General Manager Sales and channel Management Mr. C. Amarasinghe. With this new feature–filled Cash Deposit Machines, customers can instantly deposit cash straight into their BOC account to be credited real time without an additional charge. Unlike many cash deposit machines which requires money to be fed into the machine note by note or be inserted into an envelope, this machine allows customers to place a total bundle of 200 notes in a mix of any denomination in a single transaction. This machine also accepts deposits made by ATM cards or fund transfers made by simply keying debit account and the credit account numbers as per instruction displayed on CDMs graphic screen. Currently the maximum deposit value using an ATM Card for a customer’s own account is set to Rs.1 Million and cash deposits to one’s own account or third party is set to Rs.200,000/-. Coming up with innovative ways and means to enrich the lives of the bank’s diverse customer base, the Bank looks forward to extend this facility further within the branch network that is spread across the country. Operating these CDMs are made easy as all simple steps that need to be followed are displayed on the machine’s graphic screen guiding the customer step-by-step till the end of the process. The customers will receive a detailed mini-statement once the transaction is completed. If customers prefer to make the transaction completely paperless this CDM gives the customer the opportunity to activate an SMS alert to be received to a given mobile number. Similarly ATM machines also provide a convenient service for its customers with quick cash requirements allowing customer to assess his/her account status by issuing a mini-statement as an option. If not customers simply can check for their account details/ balance inquiry through the display screen of the ATM by following simple instructions given on the screen. The CRM machine works both ways as a cash recycler machine that allows customer to deposit, transfer, pay utility bills and withdraw money through the same machine. Through the Digitization process the Bank was able to embark on Green Banking effectively. In similar initiatives such as widening the CDM/ATM network and similar technology the Bank successfully reduced the carbon footprint on the environment whilst empowering customers. Leading the Sri Lankan Banking industry with over 79 years experience, the Bank of Ceylon has become the most stable and the trusted bank in the country that serves Sri Lankans from all walks of life helping them to build their lives and making themselves financially stable whilst uplifting the country’s economy. Based on the strengths of the Bank’s Balance sheet “The Asian Banker” named “BOC” as the Strongest Bank in the country for 2018 and to be among the 500 strongest banks in Asia-Pacific region. The Bank earned global recognition as one of the top 1000 banks in the world, as listed by “The Banker Magazine” (UK). “BOC” was awarded the “Peoples Service Brand of the Year” at the SLIM – Nielsens Peoples Awards 2018, which reflects the brand strength among general public. The Bank claimed its award as the only Sri Lankan brand recognized as one of Asia’s Best Brands in 2013 by the Chief Marketing Officer’s Asia Council (CMO Asia Council) based in Mumbai, India. Brand Finance Lanka in partnership with media services (Pvt) Ltd has ranked Bank of Ceylon as the country’s No. 1 brand and No.1 Bank for the last ten consecutive years in their “Brand Annual” publication and it was also conferred the Master Brand status for the year 2017- 2018 by the CMO Council Asia. The InterBrand too conferred “BOC” as the No.1 Brand in the country at their very first convention held in Sri Lanka. The Bank has passed exceptional milestones in recent years such as becoming the first to gain over Rs.1.8 Trillion assets, over Rs.One Trillion Deposits and over Rs. One Trillion loans and advances that strengthens the Bank’s balance-sheet with a triplet of “Trillion” components. Focusing on the Banks achievement, Fitch Rating Lanka ranked the Bank of Ceylon at AA+(lka) which is the highest rating awarded to a local commercial bank and ICRA (lk) awarded AAA rating which is the highest credit quality rating issued by ICRA Lanka. BOC won the merit award for the Annual Report 2015 under state owned enterprises category at the Excellence in Integrated Reporting Awards – 2016 conducted by the Institute of Certified Management Accountants of Sri Lanka. The Bank of Ceylon currently maintains a network of 629 local branches and an international branch network compromised of three overseas branches in Chennai, Male and Seychelles and a subsidiary in London.